Here’s a short blues saxophone line. Something I heard a while back. Figured I would share it. Good to have music you can pull out whenever you want. Listen, it’s also written, and slowed down note by note. Click the ‘share’ button if you like it! And leave a comment. I play it on tenor sax, also recorded it on alto. The line works over an A Minor chord, but could work in other changes as well. Play around with it. And I started on beat two, but you don’t have to! That was excellent. I have not yet trained my ear. The written notes are the only way I can play this. Please leave more. That’s a cool lick. I like it. Yeah.another sax clip lesson saved to my HD. I can pick up notes by ear fairly well, but I like this technique of showing written notes as well. Cool, thanks Donnie. I figure ear training is a good skill, but it’s faster to teach with the notes on the staff. Without audio, that can be lacking though. Thanks,Neal It sounds good for my old conn’s Tenor. Thanks Warren, glad you like it. As I do not read music is it possible to put the notes down in concert notes not saxaphone notes, as I play in a band I only use concert notes when playing so I do not have to Transpose. It makes things so much easier.EG when the band plays in concert A I autamatically play a B but I know it as an A note. That’s interesting you think of all notes in concert, I see how it could be useful. Probably would be good for you to learn how to transpose and/or learn by ear. Neol , I think that is excellent ,I like it . So many ways of playing the same tune . Warren 28/8/11. What are the notes for Alto to get it to play in the same key? Hey Andy, to play it in the same key, the first note is Eb on tenor, that makes it a concert Db, which would be Bb on alto. 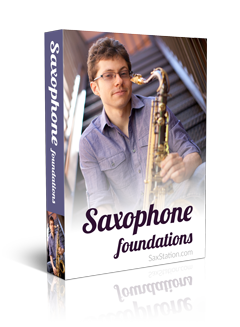 I recorded it on alto in another key on http://saxstation.com/blues-saxophone-line-alto-sax.htm . Might record that again and or record it in the key I played it on tenor. Transposing is a bit beyond me at the moment, but I guess it would have to go up an octave since it goes down from the Bb. I’ll stick with the key in your Alto version. Hey Andy, after you asked me about that I actually figured it out on alto sax last night. The lowest note if you transpose is an E on the bottom of the staff so you actually wouldn’t need to go up by an octave. Though you could. Seems like it would actually be easier to play in the lower octave. Good. I’ll look forward to seeing it. Just looked at it again. I see it would be the second Bb so it should work in the same octave. how do you make the glissando on the last note A? The fall at the end? That can be chromatic or whatever combination of notes that seems to work. I have just checked this out and played it this morning. I thought it was great. Having it broken down and played back makes it so much easier to grasp. I am self teaching from books and it can be rather difficult at times! Wish to learn too by ear one day. Cool, glad you like it. I did a few video lessons with music by ear if you want to check them out and I made a class on ear training. I really enjoyed them/ I am starting to work on the blues and your teaching videos have been great..